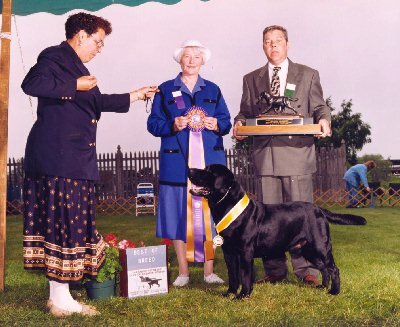 "Aaron" was the #1 Labrador Retriever in the USA in 1997, '98, '99, the only Labrador to ever do this 3 times to date!!! Multiple Group winner and multiple Specialty BOB winner. Aaron beat the breed record on breed points. 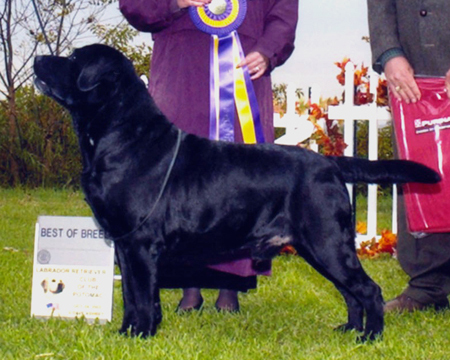 Also he won many Best of Breeds at Labrador Retriever Specialties and many times won breed from the veterans class! He won tons of Stud dog classes etc. If you want temperament this is the dog! Of all the dogs I have owned in my life he had the best! If every lab in the world had his temperament their would be no other breed of dogs around!